Switzerland Inn is surrounded by hiking trails for all levels of experience. Mount Mitchell, the highest peak found in the eastern part of the United States, is home to several NC Mountain Hiking Trails. Many trails lead to the summit which rests at over 6,000 feet above sea level. 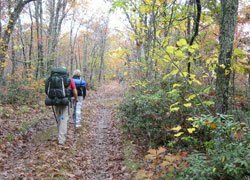 Varying from easy to strenuous, the Blue Ridge Parkway Hiking Trails near Little Switzerland NC are great trails for families and group hikes. Grandfather Mountain has 11 NC Hiking Trails that vary in difficulty from easy nature walks to incredibly rigorous treks through some very steep wilderness. Here are directions to some of our favorite trails: Crabtree Falls – Strenuous - 3 mile loop - Drive 6 miles south on the Blue Ridge Parkway to Crabtree Meadows. Exit right and stay right to falls parking area. This trail is rugged with a lot of large rocks. Trail crosses creek at the base of the waterfall. Beautiful High falls with moss growing on rocks. 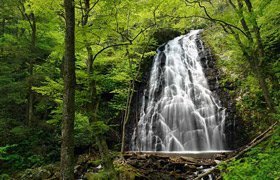 Linville Falls – Moderate - 2.5 mile round trip - Drive l8 miles North on the parkway to Linville Falls Exit on the right which is just after the Linville Falls Community (Hwy 221) exit. Follow drive to parking area and ranger hut. Falls are approximately one mile down a relatively easy path. There are an additional two hikes to upper fall and down to the river. Ridge Road - Easy - 2 mile round trip - From the Switzerland Inn entrance walk down driveway past shops and A-Frame cottages. This gravel road is flat and takes you through a quaint little neighborhood of summer and year round homes. 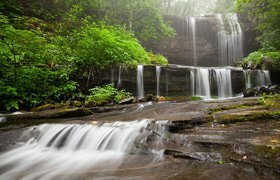 Grassy Creek Falls- Moderate - 2 mile round trip - From the Switzerland Inn entrance walk to 2nd stop sign, take right, go under parkway and take immediate right on to a gravel road. Stay on this gravel road across small stream until it splits (3/4 mile). The left road will have a blue gate. This is a private drive, please do not trespass. Take the right road down to the waterfall. The road is above the falls. If you choose to take the steep rocky path down to the base of the falls, please use extreme caution. Wildacres Trail - Moderate - 7 Mile Loop - From the Switzerland Inn entrance walk to the 3rd stop sign, take right, go to post office, the road will split, take the high road. Go 1 mile to Parkway overpass, go under and take immediate left on to a gravel road. This road will pass under the Parkway again, keep going another ½ mile. Look for old roadbed on your right; it will be blocked with posts or a gate. Follow this old road bed 1.5 (approx) miles. Look for arrow high up on a tree pointing up the hill to your right. Follow this narrow path up hill to Deer Lick Gap on Parkway. Take the Parkway right (north) 3 miles back to the inn. There are several golf courses near Switzerland Inn that welcome all golfers. Grassy Creek Golf Course is located just a short drive away from Switzerland Inn and is a spectacular mountain course to play. 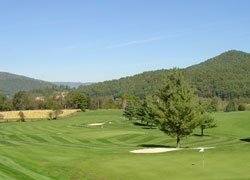 Located in Spruce Pine, Grassy Creek Golf Course is semi-private and is open to non-members and vacationers. Mount Mitchell Golf Course is a breathtaking Western North Carolina Golf Course offering the very best in golf. The course's spectacular design is virtually flat as it is situated in the Toe River Valley; however, the course is surrounded by the Blue Ridge Mountains and Mt. Mitchell which towers above in the distance. There are dozens of great North Carolina Trout Fishing spots in Mitchell and McDowell counties, near the charming village of Little Switzerland NC. For some exciting creek fishing, Big Rock Creek, Cane Creek and Little Rock Creek offer over 9 miles of stocked North Carolina Trout Fishing. 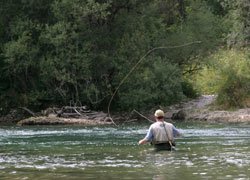 Wild trout waters like Green Creek, Wiles Creek and the famous Andrews Creek in the Upper Wilson Creek area are also hidden away and offer spectacular NC Trout Fishing amidst some splendid mountain scenery. Also, the North Toe River near Altapass Road is a great place to fish, however this region is a bit more popular and you're likely to encounter tourists and large groups. Looking to sit on the shoreline and cast away? Enjoy the great Trout Ponds in Western North Carolina like Buck Creek Trout Farm, located just minutes from Little Switzerland NC. They are located at 74 Rainbow Trout Drive, Marion, NC 28752. A few trout farms in the Marion area also operate small ponds where you can fish for a small fee. The Toe River is a fantastic smallmouth fishery and is a very relaxing and scenic river to float. During the warmer months, early morning and late evening floats are more productive. Western NC offers some of the best fly fishing opportunities on the East Coast. From the Smoky Mountain National Park along the Blue Ridge to the "Three Peaks Region" of Mt. Mitchell, Roan Mountain, and Grandfather Mountain. For more information on fly fishing in the mountains of North Carolina, visit www.nconthefly.com. 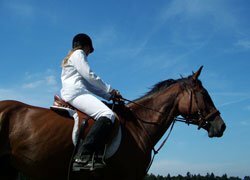 Springmaid Mountain offers a wide variety of equestrian services including trail rides, lead line rides for children, ½ day and over night trips, and daily and long-term boarding. For private and guided horseback trail rides stop by Banner Elk Stables for guided trail rides near Banner Elk; a charming resort community located just a few minutes from Little Switzerland NC. The Blowing Rock Equestrian Preserve boasts 17 barns, a large grandstand arena and a schooling arena in addition to hosting the longest running horse show in North Carolina, the Blowing Rock Charity Horse Show each August. 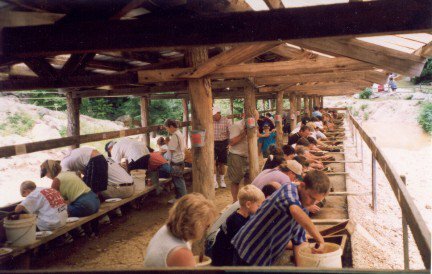 Families and groups of all sizes love going Gem Mining in NC when visiting the NC Blue Ridge Mountains. Little Switzerland NC is centrally located to all of the NC Gem Mining spots where gems like garnet, amethyst, emeralds, smoky quartz, white topaz, aquamarine, peridot, rubies, and sapphires are all waiting to be discovered. The gemstones are cleaned and miners will see the gems as their vibrant colors and shapes are revealed. NC Gem Miners can identify what they have found and have their stones inspected free of charge. Many visitors to the NC Gem Mines have their stones cut and made into jewelry by the experienced gem cutters and gemologists. Emerald Village is a fascinating group of gem and mining attractions located just 3 miles from the Switzerland Inn. Here you can tour the underground Bon Ami Mine at the NC Mining Museum where you’ll see historic mining equipment and a splashing waterfall! Gem Mountain is also located only a few miles from the Switzerland Inn in Spruce Pine. Discover beauiful gems while panning in any weather condition. High in Western North Carolina are truly awe inspiring mountain ranges, valleys and vistas and hundreds of artists working in just about every imaginable medium. Home to the renowned Penland School of Crafts and the beautiful Trillium Gallery, visitors to Little Switzerland relish browsing and shopping at the community's many art galleries. Tons of popular Western North Carolina Festivals take place in the High Country. Visitors flock to the region to enjoy events like the North Carolina Gem and Mineral Festival, the Woolly Worm Festival and the Grandfather Mountain Highland Games all of which take place near Little Switzerland NC. Smaller community gatherings like the Valle Crucis Country Fair, Spruce Pine's Fire on the Mountain Blacksmith Festival, the Mt. Mitchell Crafts Fair in Burnsville and the Riverwalk Arts Festival in Newland, NC showcase local artists’ talents and are great spots to hunt for one-of-a-kind handmade treasures. North Carolina's Blue Ridge Parkway, running 470 miles from the Virginia border to Great Smoky Mountains National Park, is the longest designated scenic highway in North America. Shielded from all commercial development, the Parkway is like a wilderness trail for motorized travelers. Snaking along mountain ridges, at an average altitude of 3,000 feet, the Parkway offers nearly continuous views of the forested hills, mountain valleys and open meadows native to the Blue Ridge. The Diamondback, a twisting route with more than 190 curves in a 12 mile loop, links Marion NC to Little Switzerland NC. Click here for information on motorcycle rentals Little Switzerland Motorcycle Rentals, or here for sport bike rentals. The mountains of Western North Carolina are the ideal backdrop for your adventure filled vacation. Thrifty Adventures is located a short distance from the hotel in Little Switzerland. They offer a variety of adventures for all ages and ability levels. River trips take place on the Toe River in downtown Spruce Pine and climbing takes place in the beautiful Linville Gorge. Shuttles are provided. 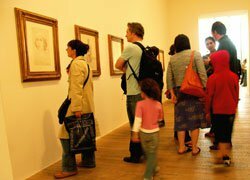 You can easily book online, by phone or email. We recommend booking your trips early to secure your spot. 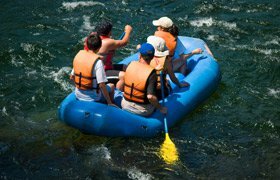 There is fun for the whole family rafting and tubing on the Toe River with Loafers Glory Rafting & Tubing. You will float through the rapids and relax on the many beaches. There are several stops to swim and explore the surrounding landscape. Or you can take an exciting tubing trip down the scenic Toe River and play the day away. With over 40 years experience, Nantahala Outdoor Center has shared the outdoors with millions of guests on whitewater rafting trips and countless other activities from family-friendly trips to action-packed adventures. The world-class staff leads whitewater rafting trips on the Southeast's best rivers, including the Chattooga River, Cheoah River, French Broad River, Nantahala River, Nolichucky River, Ocoee River, and Pigeon River. Climbing is an adventure of place, self, movement and moment! Challenge yourself physically and mentally, explore your outer limits, and embrace the opportunity to connect with nature in a very personal way. Whether you are a complete novice, looking to hone up and build on your previous climbing skills, or fall somewhere in between, Rock Dimensions can to help guide you to that new dimension! 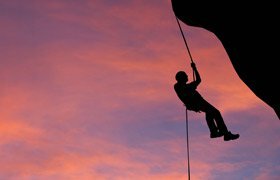 Learn from those with a passion for the outdoors and the adventure of climbing! There are lots of cycling and mountain biking opportunities in the High Country. For an extreme ride, try out the Blue Ridge Parkway. With smooth pavement, views and challenging routes, the Blue Ridge Parkway is a great place for the experienced cyclist. Start out at Little Switzerland NC at Milepost 334 and travel 41 miles to Blowing Rock and the Moses Cone Manor House at Milepost 294. This route is not only one of the most scenic; it affords uphill and downhill sections for a versatile ride. If you are looking for rugged mountain biking, try out the 200 miles of trails in the Pisgah National Forest. The Wilson Creek Recreation Area and Mortimer Recreation Area are known for having some of the best mountain biking trails. 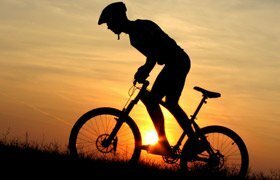 For a traditional biking experience, try the Mountains to Sea NC Bike Route which travels through Burnsville NC and Boone NC. Catch a few miles on this 900-plus trail right in the heart of Yancey County NC. Also in Burnsville is the Yancey County River Cruise, a 37.4-mile trail that takes you along the banks of Jack’s Creek and the Toe River. Experience a real canopy tour and zipline adventure that takes you into the trees with Navitat Zipline Canopy Tours . More than just a 3 hour zipline experience, enjoy 10 zips, 2 rappels, 3 hikes and 2 bridges. All equipment is provided including helmet, full body harness, trolley, gloves, tether lines, and two canopy rangers per group. 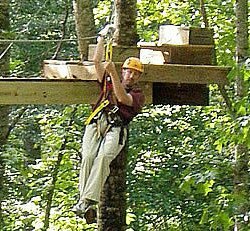 At Hawksnest Zip Lines we offer the longest North Carolina Zip Lines and the best zip line canopy tour in the state of North Carolina. Hawksnest Zip Line in Banner Elk, western North Carolina offers 4500' elevations and we are adding up to EIGHT more lines during the summer of 2011. Currently they offer 10 zip lines that create a 1.5 miles of course with some lines zipping you from 30 to 150' off the ground at speeds from 25-30 mph! Our cables range from 300' to 1800' in length and that creates a LOT of squeals from fans! Experience the biggest and best – with the most spectacular views of the Blue Ridge Mountains.